If traveling by air, Syracuse Hancock International (airport code: SYR) is Syracuse’s only airport, and the closest airport to the Marriot Syracuse Downtown hotel and Syracuse University. The airport is located north of the city. Please note public transit between the airport and downtown is limited. However, taxicab and app-based ride sharing services like Uber and Lyft are available at SYR. Additionally, Syracuse may be reached by, among others, Amtrak and Megabus, stopping at William F. Walsh Regional Transportation Center (RTC). The city’s CENTRO buses regularly run from RTC to the Syracuse University (SU) area. These CENTRO tools might also be helpful. Go on Interstate 81 S and take exit 18 toward Harrison St/Adams St. Merge onto Harrison St. Make a sharp right onto E Onondaga St. The hotel will be on the right. Again, please note that there is not much in the way of public transit between the airport and downtown. However, taxicab and app-based ride sharing services like Uber and Lyft are available at Syracuse Hancock International Airport. Go on Interstate I 81 N and take exit 18 for Adams St toward Harrison St. Continue onto Almond St. Turn left on to Harrison St. Make a sharp right onto E Onondaga St.
Go on Interstate 90 or go on Interstate 690 to Interstate I 81 S. From Interstate 81 S, take exit 18 toward Harrison St/Adams St. Merge onto Harrison St. Make a sharp right onto E Onondaga St. The TAG will be held in Eggers and Maxwell Halls at Syracuse University. 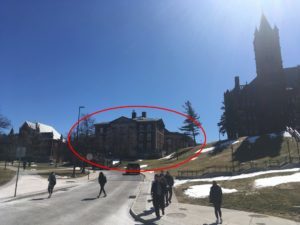 These two buildings are connected, so please be aware of which one you are in when you are trying to find sessions. Ridesharing (Lyft and Uber) and taxis are available in Syracuse. Tell your driver that you want to go to Eggers Hall. As you enter the parking lot adjacent to the building, Eggers/Maxwell Hall will be on your right. The Marriott Hotel offers a complimentary shuttle service from 7:30 am to 10 pm to any location within a one-mile radius – which includes Syracuse University. Due to the anticipated high demand for the shuttle during the conference, this service will be first come first serve basis. To request a ride, go to the Bell Man’s Station. The conference is 1.3 miles from the Marriot Hotel. If you wish to walk, leave the hotel and go left (south) on West Onondaga Street. At the first intersection, make a left onto Harrison Street. Continue on Harrison Street for .8 miles and make a right turn onto South Crouse Avenue, which will be the fourth street after you pass underneath the interstate. 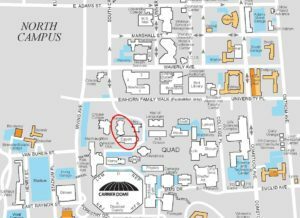 After two blocks, you will pass a guard station, at which point you will be on campus. Ahead of you on a hill you will see three buildings. Maxwell is in the center. For attendees driving to the conference, several parking garages are available around campus, including the University Avenue Parking Garage (1101 East Adams St.), the Irving Garage (500-598 Van Buren St.), and the Sheraton Syracuse University Hotel and Conference Center (801 University Ave., garage is accessible from Waverly Avenue). These garages are not free. Free bus service is also available on the Connective Corridor (Bus Route 443). The closest stop to the Marriott Hotel is at the intersection of West Fayette and South Montgomery Streets (map). For timing purposes, this stop is located between the Warehouse and the Center for Excellence (stops E and F on this timetable). To get to this stop, leave the Marriott Hotel and go right (north) on West Onondaga Street. At the first intersection, make a left onto South Warren Street. After two blocks, make a right onto West Fayette. The intersection with South Montgomery Street is in one block. The bus will drop you off on campus at College Place. Use the following map to get to Eggers/Maxwell Halls from this stop. The TAG party will be held at the MOST (500 S. Franklin St.) from 7 pm to 11 pm. This is .4 miles from the Marriot Hotel. 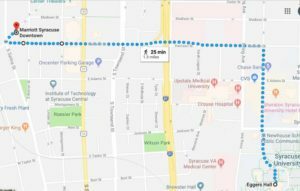 To walk to the MOST from the hotel, leave the main entrance and go left (south) on West Onondaga Street. At the first intersection, make a right onto South Salina Street. After one block, make a left onto West Jefferson Street. After two blocks West Jefferson will become a circle (called Armory Square). Make a right. The MOST is in the center of the circle. The entrance is just after North Franklin Street. Pay attention to your surroundings and maintain your personal space. If a person moves inside your comfort zone, move away. If that person persists, run. Walk in lighted areas and on established paths. When possible travel with others (this might be a good time to meet new colleagues or catch up with those you have not seen in a while). Despite these precautions, we hope that you will get a chance to explore Syracuse!